This annual event features elected officials from all 3 branches of Ohio's state government discussing their priorities for the year ahead. Sponsored by the Ohio Associated Press Media Editors, Ohio Association of Broadcasters and the Ohio Newspaper Association. 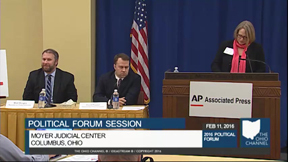 Moderated by the Ohio AP's Statehouse Correspondent Julie Carr Smyth. This segment of the program features a Q&A with Ohio Democratic Party Chairman David Pepper and Ohio Republican Party Chairman Matthew Borges.